Herdez is teaming up with Foodbuzz to host a recipe contest. The prize is a little cash and a basket of Herdez products. 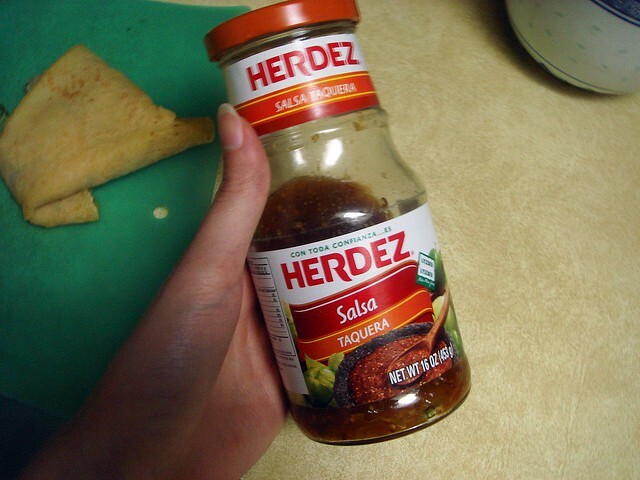 I would love to win because Herdez has a nice variety of salsas, good to eat with chips or to use in recipes. To be eligible, the recipe has to feature a Herdez product. I chose the Salsa Taquera, a smoky tomatillo salsa with red peppers. It's a little different than other salsas I've had in terms of flavor and packs a spicy punch. My recipe is a formal take on Baja fish tacos, using cornmeal crepes in place of corn tortillas. 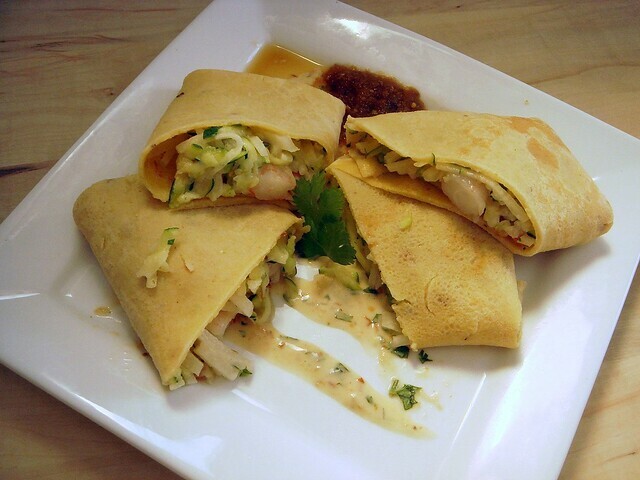 The crepe is filled with a jicama-zucchini coleslaw dressed with a spicy and tangy sauce, and shrimp. Using the salsa in the crepes, sauce, and shrimp makes the dish spicy. The spiciness compliments the flavors without overwhelming the other tastes, though. 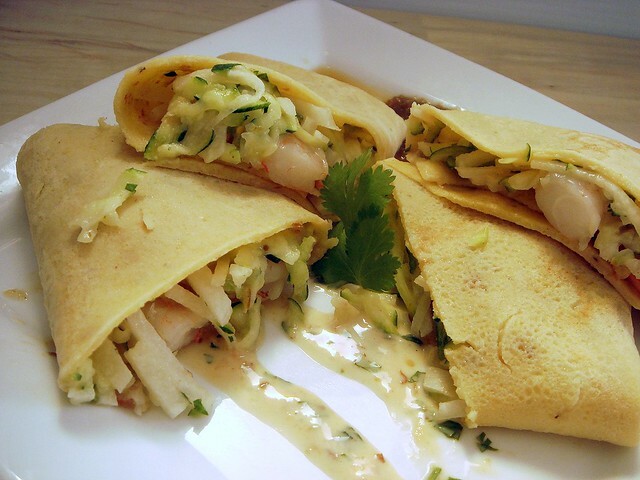 The silky savory crepes, made with cornmeal, lend a nice textural contrast to the crunch of the slaw. I found a recipe online for the crepes, subbing in some salsa for the liquid. Don't be afraid to try your hand out at making crepes. It's one of those recipes that seem more difficult to make than they actually are. The batter is easy to work with, and you just need to make sure that crepe is set before you try to flip it, otherwise it might tear. A nonstick skillet makes the job much easier. For the slaw, I used julinned jicama and grated zucchini. I left out cabbage, a traditional slaw ingredient, because I felt it would have been too prominent of a taste and texture. The slaw was tossed with a simple sauce of mayonnaise, salsa, fresh lime juice, cilantro, and garlic. I chose shrimp instead of a white fish because I like shrimp the best. Usually I cook with raw shrimp, but this time I got precooked shrimp and heated it in a skillet with some of the salsa. I didn't chop it this time, though I would next time because it makes it easier to slice once inside the crepes. This recipe would be perfect for a weekday brunch or a dinner party. The crepes can be made ahead of time and warmed in a skillet before using. I guarantee that this is a meal that will be talked about long after it's over. In a medium bowl, whisk together flour, cornmeal, and salt. Whisk milk, Herdez salsa, eggs, and butter together in another bowl; pour into dry ingredients and whisk until smooth. Let batter rest at room temperature for 30 minutes. To prepare filling, mix jicama and zucchini together. In a small bowl, blend together mayonnaise, salsa, lime juice, cilantro, garlic, and salt until smooth. Add 2/3 of the sauce to the vegetables and toss to coat. Set aside. Heat a 9-10 inch nonstick skillet over medium high heat; spray with cooking spray. Lower to medium. Pour 1/3 cup of batter onto top half of skillet, immediately tilting and rotating skillet to coat bottom. Cook for 15-20 seconds, or until top of crepe is just set. Slide a spatula underneath and flip; cook for an additional 15-20 seconds. Transfer to a plate. Repeat process with remaining batter. Spray bottom of skillet with cooking spray if needed. To form crepes, place a crepe on a flat surface. 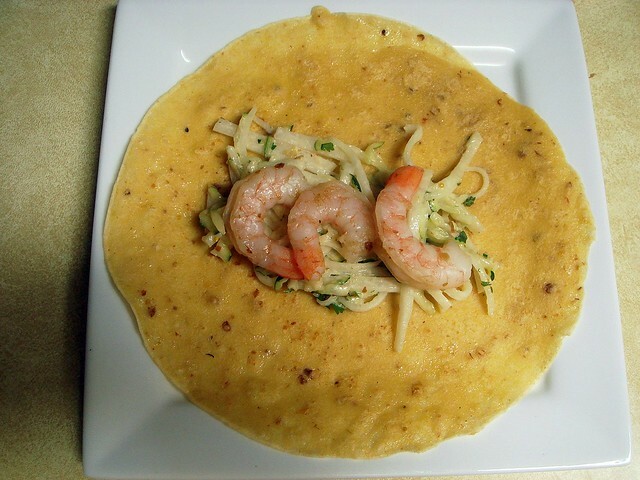 Spread a few tablespoons of coleslaw onto the center, topping with 1-2 tablespoons of chopped shrimp. Fold in sides, then fold crepe up from the bottom. Fold once more, making a tight rectangular package. Slice in half on a bias. Spread sauce onto bottom of a plate in a zigzag. Place about 4 crepe halves on each plate. Garnish with additional cilantro if desired, and serve with extra salsa. oooh your crepes turned out perfectly--love the idea of cornmeal in them!